Moving Towards a Zero Waste Bute is an ambitious plan to benefit our community with improved amenity, reduced costs and sustainable jobs. There have. over the last year. been many rewarding moments which have been shared through this blog and other media along the way. Recycling rates are up 30%, reuse in business and domestic settings has become part of how we think with many tonnes diverted back into our community, and sharing resources is becoming more common practise. Many people have become passionate about reducing their waste and improving their reuse and recycling rates. All fantastic news! However the biggest challenge still remains with people who haven’t yet embraced the concept of viewing waste as a resource. We can’t just ignore this can of worms! We should recognise and work towards solutions for sites where there are real difficulties of space, and with bigger family households or family members with health issues. However, these challenges do not apply to everyone, for some the biggest challenge is their own behaviour and unwillingness to consider the changes that need to be made, along with a lack of consideration for their neighbours and their neighbourhood. This blog is about the those members of our community who haven’t taken the time to be considerate. It should be as unacceptable to make a mess of our island as it is to drive drunk through its streets! There is no excuse for not picking up after your dog when walking through the town! 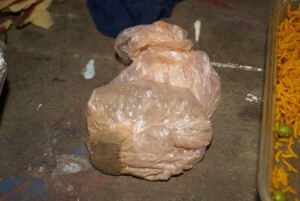 There is no excuse for dumping dog foul into your neighbours recycling bin or hanging it from a tree. There is no excuse for dropping cigarette ends on the pavement! Public houses have provided bins for these and there are shared bins around the town. There is no excuse for not recycling! There are plenty of solutions in place, and plenty of guidance for what is a relatively simple set of actions. 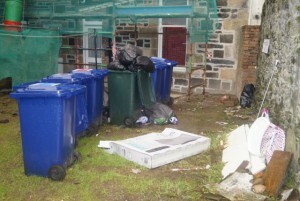 There is no excuse for fly-tipping in back courts and green spaces around Rothesay or in the countryside around! 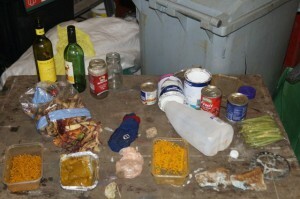 There are facilities available to take your rubbish and services offered to support you if needed. It costs Argyll & Bute Council over £12million per annum in Waste Management, a figure which could be much less if we all played our part. What is needed is for each person to consider the waste they create. Much of it can be avoided with some very simple changes, the main one being taking responsibility for our own behaviour. Consider your value as a member of this community, are you part of the problem or helping create something good? Consider the health hazards for you and yours. Consider the impact on your neighbours and the state of your neighbourhood. 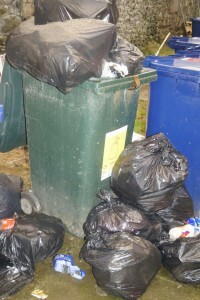 Consider the people employed to handle your recycling and your waste. Consider the experience of visitors to our island. In short, be considerate! If you have been affected by any of the issues raised in this blog, the below may be helpful. To report fly-tipping – click here. If your area has an issue with dog fouling – click here. To request an uplift of bulky items unfit for reuse – click here. Clothes and textiles can be donated to local charity shops, deposited in textile banks at schools and bring site, or put out for recycling on your normal collection day. Textile recycling bags are available for free from ReStyle, Montague Street or Recycling Centre, Colbeck Lane. Furniture, white goods, and many household items can be donated to local charity shops – Fyne Futures will view and collect useful items for free – 01700 503181 to make arrangements. Glass can be taken to bring sites in Rothesay, Port Bannatyne and Kilchattan Bay.